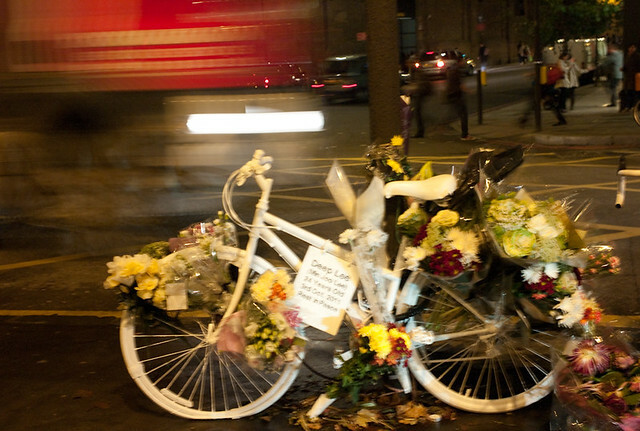 Kenji Hirasawa is the boyfriend of Deep Lee, who was killed by a lorry cycling at King’s Cross on 3rd October, 2011. Kenji, who gave a poignant interview to the “Camden New Journal”, wrote an open letter to Camden’s Culture & Environment Scrutiny Committee and gave me the permission to publish it on the blog. “My girlfriend Deep Lee (Min Joo Lee) was killed in a car accident at the junction of York Way and Gray’s Inn Road on 3rd of October, 2011. I have submitted this email as I would like the council to consider this junction as extremely dangerous for cyclists and consequently needs some immediate improvements made to protect local residents to prevent a similar accident happening again. The issue with the road where my girlfriend was killed by the lorry is that there is no cycle lane and the road is too narrow to share the space with both cars and cyclists. Therefore cyclists are forced to be extremely close to vehicles and it is difficult for them to be seen from large trucks. My girlfriend was just in front of the truck and both her and the truck driver were waiting for the traffic signal to change. the mirror which is placed to see just in front of the car around bumper. Consequently Deep was run over. I would like the Council to consider making the road safer and implementing changes such as providing cycle lanes like those used in the Netherlands or making selected roads safer for cyclists and informing cyclists to use these roads. With the number of cyclists on the roads increasing all the time (and with the college of Central Saint Martins, where Deep attended) recently having moved to King’s Cross, I am keen to prevent similar accidents happening again in the future. This, combined with an increased number of trucks being used to construct the Olympics sites and prepare London for the games makes the risk all the greater. I would like to urge the council to take some immediate action to improve the road layout for cyclists before more accidents happen and more cyclists are killed. The junction where Deep Lee died has been heavily criticised by road safety experts and local pedestrian and cycling campaigners for years. A 2008 report commissioned by TfL came to the conclusion that the whole area was highly dangerous and should be re-designed. However, TfL did not heed that advice. Smoothing the traffic flow for motorised vehicles was deemed more important than the life of cyclists. 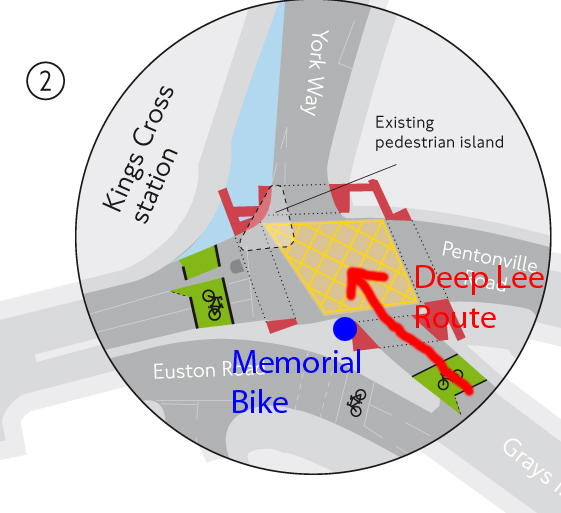 ” Your proposals at that junction in the direction [Deep Lee] was travelling, amount to a decision to repaint the existing cycling box! This completely ignores the problem that there are two lanes of traffic, including many HGV vehicles, entering that junction from Grays Inn road. At that junction the road narrows, so vehicles jostle for position and they also turn through 45 degrees, with the added distraction of many people crossing the road, cyclist end up being crushed under the wheels of HGVs. That is what happened to Deep Lee. In 2012 and foreward there will be many more pedestrians crossing the street, more and more cyclists and HGVs servicing the Kings Cross site for another 5+ years.